Positioned in the northwestern area of Orange County, California and across the border of Los Angeles County sits the beautiful city of La Habra. La Habra’s neighboring cities are La Habra Heights, Brea, Fullerton and Buena Park. La Habra is centrally located with Los Angeles being 30 miles away and Anaheim is only a mere 8 miles away. La Habra’s name was originally Rancho La Habra. The name referred to the “pass through the hills”, the natural pass to the north between the Chino Hills and Puente Hills into the San Gabriel Valley first discovered by Spanish explorers in 1767. During the 1920’s Rudolph Hass planted the Hass Avocado Mother Tree in La Habra Heights which is just north of La Habra. During this time La Habra earned the distinction as being the largest avocado center in Southern California. The Hass avocado has become one of the most popular cultivars worldwide. La Habra’s city tree is the avocado. Among the cities earliest settlers were the grandparents of former president Richard Milhous Nixon, the Milhous family. The city of La Habra’s motto is “La Habra-A Caring Community”. They show this through many of the cities points of interest. La Habra’s Boulevard of the Bells which is part of the original El Camino Real route that was transversed to La Habra Boulevard during the days of the missions. You can see replica 1906 bells that have been placed marking significant historical sites that establish the historical route as “The Boulevard of the Bells”. La Habra’s world famous annual Corn Festival also shows their caring community motto, hosted by the La Habra Lions Club. The corn festival attracts thousands of visitors from all over Orange County. This event is held on the first weekend of August at El Centro-Lions Park. This fun and free event features live music, food, games and rides. The festival started as a home town dance and cookout years ago and is one of the most popular and looked forward to attractions during the summer. La Habra’s Children Museum is a great hands-on facility. Some of which is inside a 1923 Union Pacific Train depot. In1977 when the museum first opened it was the first of its kind west of the Mississippi River. The museum has over 90,000+ visitors a year. Devoted to young children this facility is truly a unique educational facility. La Bonita Sports Complex is a multi-million dollar facility and is one of the city’s crowning jewels. The sports complex has a skate park, multi-use rink and court, four lighted softball fields, playground and a concession/restroom building. Along with all the great things to do in La Habra they also have terrific restaurants like El Cholo’s Restaurant which was established in the 30’s with it Sonora style Mexican Cuisine you can have a delicious meal while looking at your favorite celebrity’s autographed pictures; from Nolan Ryan to George W. Bush who have all eaten there as well. Another great five star restaurant in La Habra is the Cat in the Custard Cup. La Habra has great schools as well. There school districts are the La Habra City School District, Lowell Joint School District and Fullerton Joint Union High School District. Troy High School is part of FJUHS District which allows inter district transfers. La Habra Real Estate has many single family homes with a limited number of La Habra condos. There are two distinct areas of La Habra, La Habra and La Habra Heights. La Habra Heights is situated in the hills above La Habra and offers beautiful Estate homes on large lots. 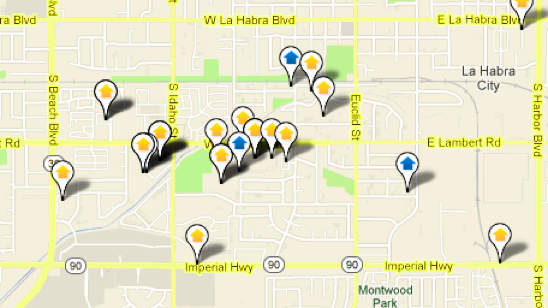 Today potential home owners can find La Habra Homes under $400,000. Experienced realtors think this makes La Habra a great option for first time home owners.